As we’re trying to make our service as accessible and simple to use as possible, we give you various ways to run your SMS communication. If you prefer your good, old e-mail client to prepare and execute SMS campaigns – we have something right for you. Our Mail2SMS service allows sending an SMS texts to unlimited number of recipients from any email software, server or CRM solution. All you need is active User account (don’t have one? Create it – it’s FREE! 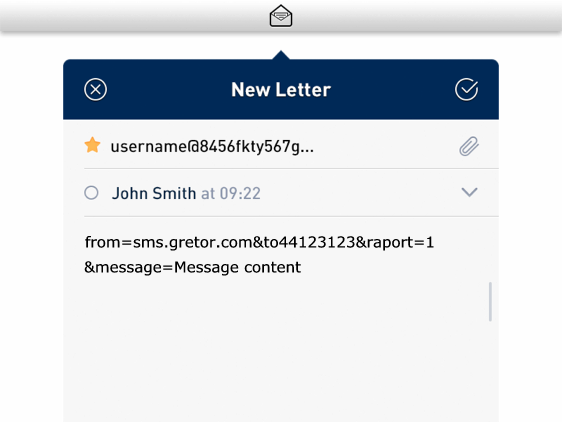 ), and remembered e-mail address: send.do@sms.gretor.com. That is all it takes! What’s more – this service is completely FREE of charge, you can use Mail2SMS service without having to pay extra for it! E-mail message should be sent as: plain/quotedprintable/base64. Important! Sender name (&from=) should be added in customers panel and activated in the first place. Parameter &message= should be given as last parameter.